Designing a salon that is stylish and functional is key to drawing in more clients. Read on to discover 12 salon design tips for 2018. Hair salons are a great business to have, but with 96 percent considering themselves both a salon and a spa, in 2018 the competition is high. How do you stand out from the crowd and get more customers through your door? Designing a salon that’s stylish and functional is key to drawing in more clients. Read on to find out our 12 salon design tips for 2018. If you’re starting up your salon business from scratch, then the very first thing for salon design that’ll make your new business thrive, is where you put it. The best locations are ones with lots of foot traffic, passing vehicles, and ample parking. It’s true that these areas are more expensive, but you’ll make way more money on your investment this way. Quiet locations mean more time and money spent on marketing your business. Why not use the cash to improve your bustling salon, instead? Every salon space is unique, so no matter the salon design ideas you’ve coveted online, it’s not one space fits all. Instead, outline your floorspace on paper, and know the dimensions. Once you’ve got your layout down pat, it’ll be easier to plan accordingly. Now you know where your salon is, and what it looks like, your next job is to list all the services you’ll offer. You’ll likely be providing a hair washing, cutting and blow-drying service, but what else will be available to your clientele? This is where you can really stand out from your competition, make customers want to come back for more, and tell all their friends about you, too. Innovative personal touches like a convenient hair-vacuum finish for busy businessmen, coming for a quick cut during their lunch break, will likely gain you repeat custom. A personal hair-shopper service, style reference area, and comfortable waiting area during longer treatments are all great ways to make your salon stand out as different. Once you know the services you’re going to offer, you can start the fun part: designing your beautiful new salon! The worst thing you can do in a salon is to have a noisy, open-plan, free-for-all space. It’s busy, crowded and lacks the calm atmosphere your customers in 2018 are after. Instead, create designated areas for your services. For good salon design, your sinks and hair-washing products should be as close to your plumbing as possible. This is cheaper to install, and easier to fix if things go wrong in the future. Keep your washing stations and products together, so customers can easily see where to go, and your staff have all the items they need on hand. Your salon chairs are the bread and butter of your business, so make them earn their keep. The best chairs will be comfortable but functional, and easy for you to reposition with a client in-situ. You’ll also need a large mirror, and space to pop down your brushes and tools, or park your mobile tool-caddy. If you decide to have wall-hanging tools like hairdryers and personal hair-vacuums, you’ll need the wall in front of your chair to be sturdy enough to take their weight. Good salon design includes thinking of these practicalities. Ensure you put in place heavy wall structures that’ll keep up with your salon’s needs. Manicures, pedicures, gel treatments, makeup – all these services are great to offer, and totally separate from your hair treatments. Section off an area that’ll house your beauty treatment stations. This’ll allow for a nicer environment, fewer distractions, and a more relaxed customer experience. You’ll be fine with light, temporary wall structures, and a door to the area isn’t necessary. Just a wall separating this area from the main salon will do. Quiet rooms are a great way to offer an additional service to your customers and can have multiple uses. For example, if clients are having longer treatments like a color or perm, then it’s often a long, tedious weight until the timer’s up. Instead, why not create a restful sanctuary for them in a quiet room. Books, magazines, even a screen or mobile device for them to view while they’re waiting, will add to the feeling of being pampered while the time ticks by. Or, for larger parties, you can treat them in their own room so they can be as giggly as they like without the noise impacting on your other clients. A light, bright space is not only beautiful but in a salon, it’s hella practical as well. Make sure your spaces are well-lit. You don’t want shadows in the areas where you’re actually working. You can use mirrors to create space, and also reflect the light around the room. When choosing your color scheme, you’ll want to mainly choose light or pale colors. A bold, intense statement wall can totally work, but use those colors all over and it’ll feel garish and enclosed. When picking permanent elements for your salon, neutrals often work best. Styles come and go, but whites and neutral earth tones are always in fashion. So, to future-proof your in-situ units, go for something neutral and then add splashes of color via accent accessories. The same goes for any tile work you have installed, your ceiling and your flooring. Bright rugs, vases, curtains, flowers – even products – can bring color and style to your salon, not just in 2018 but for years to come. Your salon furniture needs to be comfy, yet practical. Leather works well as it ages gracefully, and washes easily. If you opt for fabric, plush customer seating is always a good idea. Go for dark colors because, inevitably, there’ll be spillage at some point. The lobby is the first thing your clients will see, so you need it to speak volumes about the quality of your salon. Make sure there’s ample seating. That way, there’s somewhere to sit while customers wait. When people walk by your window and see a full salon, simply because you have limited seating, you could miss out on sales. Conversely, you don’t want too many seats so that it always looks empty. Striking a balance can be difficult, but your ideal number depends on the size of your salon. The lobby is the best place to display any products you have for sale. Have hair products on shelves that customers can access themselves. If a client can touch, read and examine a product themselves, they’re much more likely to buy. Something often overlooked by many salons is helping their customers choose a cut or style before they’re in the chair. Popular celebrity styles and hair models are great options to give clients an idea of what they can choose. By having a designated area in the lobby where clients can see a style guide based on face shape, skin tone, etc., you’ll be one up on your competition. If it’s in your budget, go one further and get a cool app on a mobile device so they can see their face against their chosen style. It’ll make life easier for them, and make your job a whole lot easier, too. Often the underdog in salon design, a great customer bathroom is actually a must for any salon worth its salt. Make sure your bathroom is a modern but calming space. White porcelain is a no-brainer for affordability and hygiene purposes. Tasteful bathroom shelving should also be included in your salon design, for diffusers and other scent-infusing items. A bathroom that smells nice is always inviting. When it comes to your salon design phase, make sure your storeroom is away from your main customer areas. There’s a lot of foot traffic surrounding a storeroom, and you don’t want customers caught up in that. Instead, plan to put it in a quiet and accessible area that customers won’t need to walk by. Salons and music go hand in hand, so make sure your sound system is up to standard. The type of music you play will depend very much on your client base. Still, you want a good quality system and ceiling speakers that discreetly but evenly distribute the sound. Anything tinny or with too much emphasis on the bass can be off-putting for customers looking for a bit of peace during a treatment. In 2018, salon clientele is often looking for that little bit more than just a haircut and style. Often, customers also expect a welcome coffee or juice with their treatment. To really stand out from your competition, a quality drinks station is the way to go. By offering their first drink on the house and any future drinks with an added charge, it gives them the feeling of getting value for money. Having a drinks station also means that, if a group of friends comes in together wanting different treatments, no-one needs to feel bad. Those with shorter treatments can buy a drink at the end and will have a place to wait for their friends to finish up. And you get to make some extra cash while they do. Ca-ching, right? 2018 is set to be a great year for salon owners, but to tap into that market, your salon design needs to be on point. Understand your space, create service areas, and offer your customers something they’ll be hard-pressed to find elsewhere. 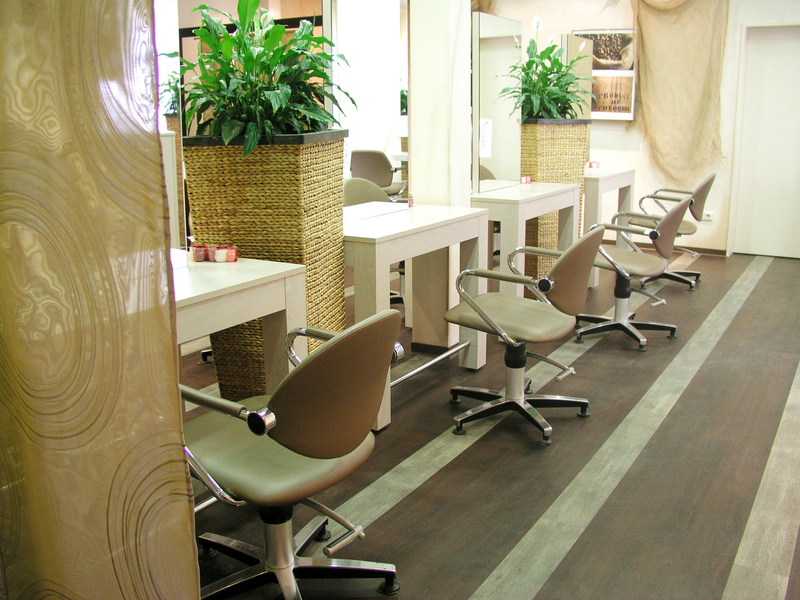 Keep in mind our 12 tips when designing your salon this year, and you won’t go far wrong. Ready to take the plunge and invest in your salon design or remodel? Contact us and see how we can help.